I remember my brother and I sitting in a United Methodist church one Sunday when the Minister said that the most spiritual person she knew was a Hindu man and she elaborated in some detail as to why that was her perception. In the Garden of Eden, being spiritual meant being in communion with God. On the fallen Earth where we now reside, being spiritual is not necessarily a good thing. Unfortunately, one third of the hosts of heaven fell along with Lucifer and they were given dominion over our Earth. If we blindly pursue our spiritual side we are nearly as likely to encounter a demon as we are an Angel of the living God. God often sends up single individuals against entire armies. This seemingly irrational action is made possible by the familiar phrase, “The world plus everything equals nothing, God plus nothing equals everything.” David versus Goliath, Jesus versus the temple moneychangers, prophet after prophet against Kings and Dynasties show the power of the individual who is in a right relationship with God. Someone that espouses a doctrine such as collective salvation is failing to trust in God and denying God’s true power. Similarly, followers of a supposedly “Christian” religion such as Mormonism, where Jesus is given the status of a son of God, instead of the only begotten Son of God, are just following another way of denying the power or unique divinity of Christ. When Catholic professors at Georgetown equate forced collection of the possessions of others by the state with cheerful, charitable giving they are again denying the power of God to provide. They would rather rely on the simpler mechanism of coercion than do the heavy lifting of actually going out and trusting God to provide for their ministries, as needed. President Obama is throwing millions of people off of the rolls of the unemployed by letting their benefits run out simply to manipulate the numbers used to evaluate the state of our economy. He could, when he had control of both Houses of Congress, have extended the unemployment benefit to any length of time. The 2-year date was arbitrary and designed to have the bulk of the unemployed taken off of the rolls just in time for the next election. This would give the appearance of lowering the unemployment rate just as he headed into the election—and would allow him to argue that we just need to hang in there—better times are coming soon. He knew his doctrine of collective salvation was not sufficient to the task at hand. Nowhere in the Bible is there even a hint of a suggestion that coercion, theft or any other form of collectivism is desired by God. When we as a people each attend to our individual relationship with God, we are given the gifts necessary to enable us to find our rolls in society. Our passion to care for the poor is a result of the Holy Spirit working in our hearts. The Bible says God loves the gifts of a cheerful giver, not the taxes of a resentful payer of tribute to the rulers of the land. The Reformed belief of the inherent sinfulness of fallen man caused our Founding Fathers to design a system of checks and balances because of their recognition that manmade institutions were corruptible. Since the institutions themselves embody the spiritual principles, we can survive tenants even of our highest office who are themselves corrupt without any real fear of too much impact on our personal lives as long as we preserve the checks and balances of the institutions themselves. Since both Obama and Romney are men who have the appearance of Godliness in their family lives, recognizing the subtle corruptions they bring due to their philosophies is going to be difficult for many American citizens who have not given a great deal of thought to what living a godly life truly means. As I mentioned in a previous article, President Obama is going to spend nearly a billion dollars during the upcoming re-election campaign trying to convince all of us to completely ignore and, in fact, break the tenth commandment. He wants all of us in the 99% to covet the belongings of the 1%. This is fundamentally counter to the Judeo-Christian ethic. 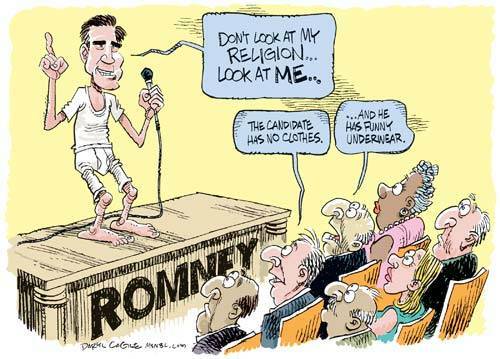 Romney has shown little in the way of core convictions. This is emblematic of a follower of a faith that is based on continuing revelation. If everything could change in a fundamental way whenever God deigns to speak through the Mormon’s current prophet, such as during the 1970’s when blacks and other minorities were suddenly revealed to have equal footing with the traditional white, Anglo-Saxon founders of the religion, then what is a fundamental, bedrock principle? God is calling his leaders to stand up and call out the apostates and heretics. We are not called to be loved as a people; we are to be the light of the world, illuminating the sins along with the virtues. Collective salvation is a heresy. Mormonism is not a Christian religion. Even though it uses a central figure called Jesus, it fails to recognize His divinity and thereby denies His power. The Jesus of the Mormon religion is not the Jesus of traditional Christianity. Idolaters, pagans and deceived Christians can all appear to be spiritual. Many can, in fact, be spiritual in the sense that they are in contact with “spirits.” Just as Christianity espouses the one true God, it also requires us to equate being spiritual with developing a personal relationship with the Holy Spirit. Having a personal demon might make someone powerful on fallen Earth, but such a person, no matter how “moral” or humane they might appear in practice, is to be excluded from the Christian community and their philosophy is not to be encouraged. We must, of course, love the sinner, but not the sin. And as long as a person clings to their sinful ways, we must shine a light on them and illuminate their wickedness. The Christian follows a lonely path. Being called out to be separate is not easy. But, while we are separate, we are not equal. We are the children of the one true God. Our kingdom is not on Earth, but in Heaven. A gay, anti-bullying activist recently made headlines by himself bullying the Christians in his audience. During his diatribe, he made an interesting observation that the Bible does not condemn slavery. He took that to mean that the Bible and Christianity is the religion of the slaveholder. Again, this is the kind of subtle twist that non-believers give when they profess to know something about our religion. Christianity is not the religion of the slaveholder; it is the religion of the slaves. The whole point of Christianity is to be content, wherever one finds themself. Humanists define peace as the absence of war; Christians are at peace during a war because of their relationship with the one true God. While everyone prays for peace, prosperity and the pursuit of happiness, Christians do not mistakenly believe that what happens on Earth is determinate for their eternal life. 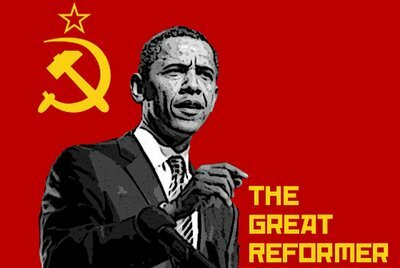 Too many pastors and political leaders are being cowed into silence about the heresies and deceptions that are being espoused by President Obama. We must speak up loud and clear and be examples for the next generation. We can have a generation of peace and prosperity or decades of civil war and political unrest. The decision is ours and we need to act decisively. We, as a church, need to return to true meaning of the separation of the Church and the State. “Congress shall pass no law” means that the church is exempt from federal laws. By allowing the IRS to use the threat of removing the church’s tax-exempt status, we are allowing the Federal government undue power over the Church. We need to push back and point out that Congress does not have the right to tax Churches, no matter what is preached from the pulpit. The Church is outside the jurisdiction of the Federal Government, period. Our country is the greatest country on earth, the greatest in all of the Earth’s history. What makes us unique and great is being systematically undermined by the socialist partners of our president. Since the Organized Church has also been infiltrated by social-justice heretics, merely setting the church apart is not sufficient. We must push for a revival, a return to the moral path only achieved by following the tenets of God’s Law. We must separate ourselves from worldly heresies and strive to be the best and do the best in everything we do. If we adhere to the principle of doing everything as though it were unto God, then we can truly stand apart and shine.